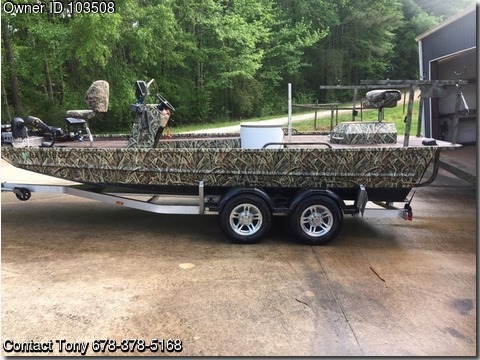 Boat is located in Carrollton,GA.Please contact the owner @ 678-378-5168...2017 19 foot River Rocket tunnel hull custom built by ROCK PROOF Boats. 21 foot deck. UHMW bottom and sides for ultimate protection. .190 Aluminum Ultra strong bottom with extra stringers added for strength 200 hp Mercury inboard Sport Jet with less than 50 hours on motor. Custom camo wrap, custom hydro deck soft flooring. 36 volt Minnkota Fortrex trolling motor with built in transducer 4 batteries. 4 bank Minnkota 15 amp onboard charger. Minnkota 40 lb electric anchor. On board bait bubbler system. Custom LED lights front and rear to light up the lake. Custom ladder on rear swim platform. Large live well with auto fill and auto recirculate features. Two large volume auto bilge pumps. Humminbird 1198 SI DI HD on console. Humminbird 998 DI on front. Custom BALZOUT heavy duty aluminum mounts. Tons of dry storage with drip proof hatches and drains. Custom 12 volt wiring receptacles for bait tanks. This is the best of the best in custom Jet Boats. Not another used boat on the market as nice as this one. Will run on plane in only inches of water. This boat is in perfect condition. Only a bruise or two on the bottom from river fishing. Custom full aluminum tandem axle trailer with NO wood. Spiffy Aluminum wheels to match trailer. Selling due to 3rd new River Rocket on order. The only reason for the sell is I enjoy building boats!! Must see and drive to understand just how special this boat is! Custom Rockproof boats are so well built that there is a 6 month wait for delivery so get yours TODAY!! This boat also has almost EVERY factory feature available and at a much lower price than many production built jet boats.Tony 678-378-5168.